As good stewards, we are intentional in sharing our treasure and give it prayerful consideration. We strive to give joyfully from our first fruits in proportion to what we have been given. There are multiple ways of giving to your parish. 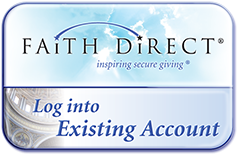 For your convenience, St. Matthew offers a simple and safe method of making offertory contributions via automatic payment from your checking or credit card account through our automated payment program Faith Direct. It’s simple and you do not need a computer to participate. You may either complete the form found in the Welcome Packet and send it directly to Faith Direct, or you may visit www.faithdirect.net using our parish code NC36 to enroll online. You will be able to securely access and make changes to your account anytime online or by calling them directly. There is no cost to you for joining or making your donations through this program. Donation cards are provided by Faith Direct which should be used weekly to indicate your participation in this program. Click here to give to the Diocesan Support Appeal online. Please be sure to list St. Matthew as your home parish. Envelopes are mailed monthly to every registered household in the parish. In addition to the weekly offertory, a Renew St. Matthew Collection is taken on the first Sunday of each month to help with maintenance, repair and upgrade expenditures. St. Matthew accepts donations of appreciated stock or securities. This method of giving may have tax benefits for you in the deferral of capital gains. Stock donation forms are available here or obtained by contacting our Chief Financial Officer Jane Balbirnie at 704-543-7677 x. 1046. Don’t cancel life insurance you don’t need! By naming St. Matthew as beneficiary, you will provide lasting financial support and possibly qualify for tax benefits as well. If you would like more information about any of these methods of giving, please contact Chief Financial Officer Jane Balbirnie at 704-543-7677 x 1046. As always, please contact your tax professional to discuss specific tax implications.